Published on March 26, 2016 by Martyn. Be the first to comment! One of the best online platforms in the UK for children’s and teenage fiction is to be found on The Guardian‘s website, where most of the reviews are written by young people themselves – the very readers authors like me are writing for. So it’s particularly pleasing to have found this wonderful review there for Twenty Questions for Gloria. “Gloria’s in a police interview room with her mum and an inspector. She’s just come home from being on the run with Uman Padeem, who’s still missing. She’s there voluntarily, but they want to get to the bottom of what happened. So, with all the newfound attention from the press, she’s here, she’s missing Uman but she’s got answers. And they’re asking her twenty questions. Martyn Bedford is an author who has many awards to his name with Flip, which I’m dying to read now. 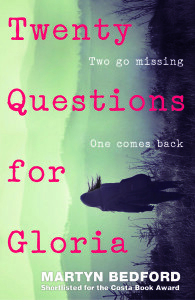 And whilst some people may find Twenty Questions for Gloria a difficult and confusing book to read, I really enjoyed it. This book has been written in a really unique and interesting way. It’s always fun to see an author’s take on storytelling, and the way of telling this tale in a format that is almost like a transcript of a police interview is something I’ve certainly never seen before. To read the review in full or to check out the rest of The Guardian‘s children’s books site, click here.